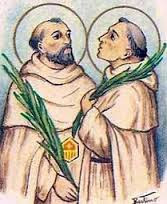 Adolphus was one of three Mercedarian friars who, in 1314, went to Tunis to free Christian captives. On the trip home, their ship was captured by pirates, and they were imprisoned. While in captivity Adolphus ministered to other prisoners and talked about Christ. His jailers murdered him to stop his speaking up.